It is with great pleasure that I write to you on behalf of the Armenian EyeCare Project as we celebrate our 25th Anniversary. I’d also like to take this opportunity to invite you to our 25th Anniversary Gala on Saturday November 18. Few things can change a person’s life as profoundly as restoring their sight. With your help, this is what we are able to do. For one quarter of a century, our organization has been dedicated to eliminating preventable blindness in Armenia and providing access to quality eye care for everyone in the country. In this time, we have literally changed the landscape of eye care delivery in Armenia forever. 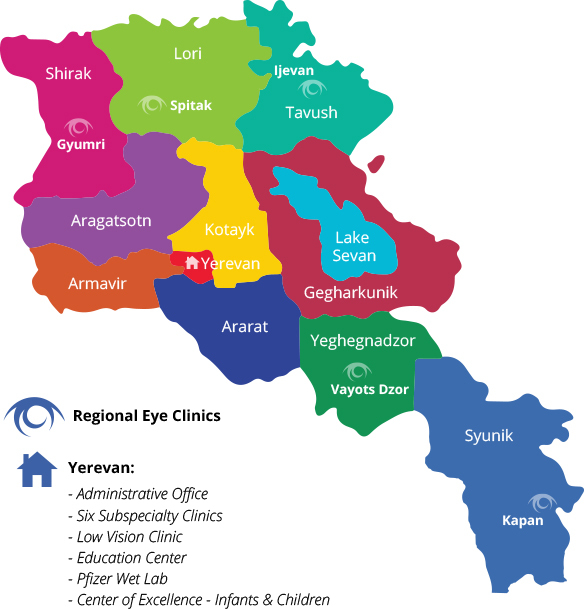 Since the EyeCare Project was founded in 1992, our organization has screened nearly 500,000 patients in Armenia and performed over 20,000 sight-saving surgeries. We’ve also delivered a state-of-the-art Mobile Eye Hospital to Armenia, bringing eye care to those living in the country’s most rural areas; developed a Center of Excellence for the Prevention of Childhood Blindness in Yerevan, saving hundreds of babies from blindness and reducing infant blindness by 90% in Armenia; and sponsored fellowships for eight ophthalmologists from Armenia in the U.S., each later returning to Armenia to train colleagues and direct Subspecialty Clinics in their field of expertise. We’ve also provided more than 70,000 pairs of eyeglasses at no cost to children and adults in need; established a medical education and training center in Yerevan with libraries, classrooms and a wet lab; trained hundreds of doctors and medical personnel in ophthalmology; and are currently working on our biggest project yet — developing five Regional Eye Clinics throughout Armenia so more people in the country can have access to quality care. It is support from friends like you that makes this all possible — and we need you now more than ever. We have accomplished much in Armenia for the past 25 years, but there is still more work to do. We are entirely dependent on donations to operate our programs in Armenia. Please consider attending our 25th Anniversary Gala at the Balboa Bay Club in Newport Beach on November 18. Your donation will enable us to deliver eye care to even more children and adults in Armenia through our many programs and Bring Sight to Armenian Eyes. In fact, as I write this while in Armenia, I’m eager to share two new programs we are working on now, which will save the sight of many more children and adults in this tiny jewel of a country. I hope to see you at our Gala — to celebrate 25 years of accomplishments and share with you what’s to come.